Pseudomyxoma Peritonei (PMP) is a rare locoregional disease characterized by disseminated intraperitoneal mucinous tumors. The urachus is a structure that connects the bladder to the allantois during the embryonic development. Less than 1% of all bladder tumours are urachus carcinomas but almost all of them are adenocarcinomas. A 75 year-old man during transurethral resection of the bladder, a bladder suspicious lesion was removed but the diagnosis was only dysplasia. Thus, the patient was suggested to have a CT. The CT showed a 9cm heterogeneus and polylobulated mass connected to the top and anterior part of the bladder. It was compatible with a urachal carcinoma. A few days before, the patient attended to general surgery consoultation and he was diagnosed with a new onset right inguinal hernia. Two weeks later, the patient was performed a inguinal hernioplasty but, during the act, surgeons finded a lot of muccous material. The pathology findings were compatible with pseudomyxoma peritonei. 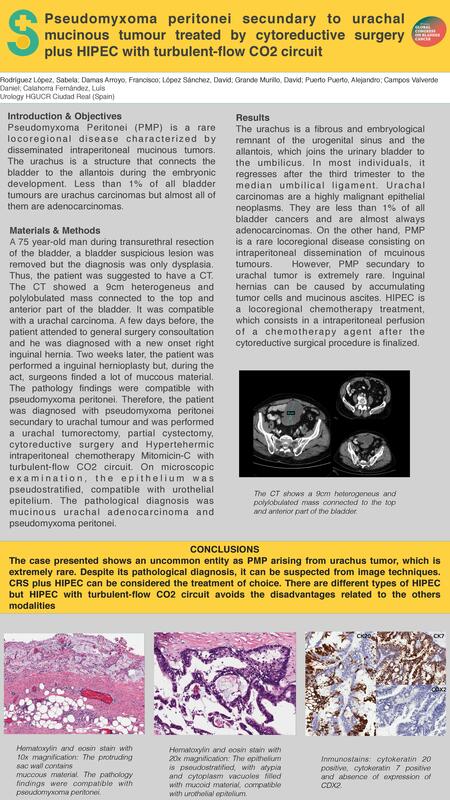 Therefore, the patient was diagnosed with pseudomyxoma peritonei secundary to urachal tumour and was performed a urachal tumorectomy, partial cystectomy, cytoreductive surgery and Hypertehermic intraperitoneal chemotherapy Mitomicin-C with turbulent-flow CO2 circuit. On microscopic examination, the epithelium was pseudostratified, compatible with urothelial epitelium. The pathological diagnosis was mucinous urachal adenocarcinoma and pseudomyxoma peritonei. The urachus is a fibrous and embryological remnant of the urogenital sinus and the allantois, which joins the urinary bladder to the umbilicus. In most individuals, it regresses after the third trimester to the median umbilical ligament. Urachal carcinomas are a highly malignant epithelial neoplasms. They are less than 1% of all bladder cancers and are almost always adenocarcinomas. On the other hand, PMP is a rare locoregional disease consisting on intraperitoneal dissemination of mcuinous tumours. However, PMP secundary to urachal tumor is extremely rare. Inguinal hernias can be caused by accumulating tumor cells and mucinous ascites. HIPEC is a locoregional chemotherapy treatment, which consists in a intraperitoneal perfusion of a chemotherapy agent after the cytoreductive surgical procedure is finalized. The case presented shows an uncommon entity as PMP arising from urachus tumor, which is extremely rare. Despite its pathological diagnosis, it can be suspected from image techniques. CRS plus HIPEC can be considered the treatment of choice. There are different types of HIPEC but HIPEC with turbulent-flow CO2 circuit avoids the disadvantages related to the others modalities.